With his dream of pitching in Major League Baseball recently foiled, South Korean pitcher Yang Hyeon-jong will stay home at least for another season, his domestic club announced over the weekend. The Kia Tigers of the Korea Baseball Organization said their star left-hander will be with them next season. Last month, the Tigers posted Yang for interested MLB clubs, in his first offseason of eligibility. An unidentified club won the bidding war for the exclusive right to negotiate with Yang but the Tigers, unhappy with the value of the bid, rejected it and made Yang ineligible for posting for another year. Yang could have pursued a move to Japan’s Nippon Professional Baseball, but ultimately decided against it, the Tigers said. “At a recent meeting with Yang, we asked him to stay with us for next year, and the player accepted our proposal,” the Tigers said in a press release. Through the club, Yang said he will try to make a contribution to the Tigers next season and then seek a new opportunity to pitch overseas. 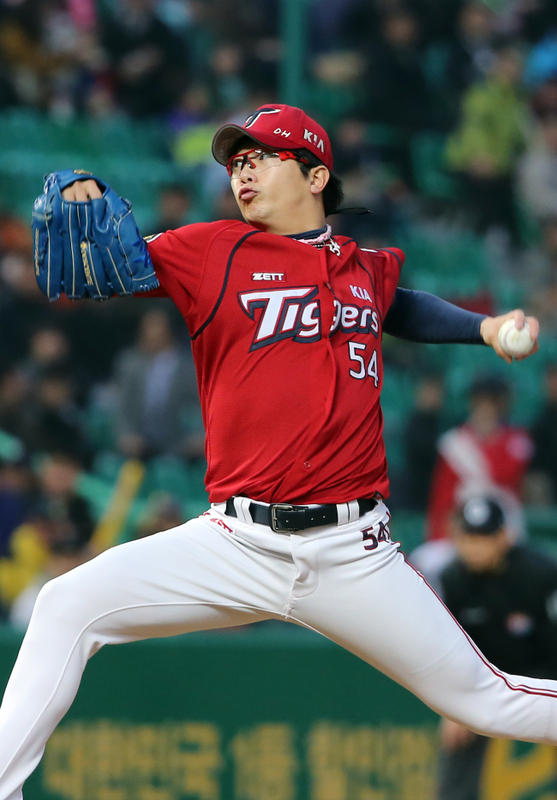 Yang completed his seventh season in the KBO in 2014 and earned conditional free agency, whereby he could be posted for MLB clubs or enter contract talks with NPB teams with the Tigers’ approval. Since the Tigers rejected the bid in posting, neither the identity of the bidding winner nor the amount of the bid was disclosed. The Minnesota Twins and the Texas Rangers emerged in separate reports as the top bidders, and the winning bid was reportedly around $1.5 million. Before Yang, left-hander Kim Kwang-hyun of the SK Wyverns was posted, and his team accepted a bid of $2 million submitted by the San Diego Padres. Kim and the Padres have until 5 p.m. Thursday to work out a contract. Yang, 26, will have the same free agency status after the 2015 season. He could decide to pitch another year and become an unrestricted international free agent after the 2016 season. In that case, Yang wouldn’t need the Tigers’ approval to sign with MLB or NPB clubs or have to go through posting. In addition to keeping Yang on board for next year, the Tigers also announced the signing of a former big league pitcher with a perfect game on his resume. They said they’ve signed 31-year-old right-hander Philip Humber for $600,000. He has a 16-23 record in 97 big league appearances with a 5.31 ERA, but he’s most famous for throwing a perfect game for the Chicago White Sox against the Seattle Mariners in April 2012. Humber last pitched in MLB for the Astros in 2013, and spent 2014 in Triple-A. Also, the Tigers re-signed infielder Brett Pill for a second year for $700,000. Pill batted .309 with 19 home runs and 66 RBIs in 92 games this past season. In other news, the LG Twins announced Monday they’ve acquired right-hander Henry Sosa, who pitched the previous season for their crosstown rivals. The Seoul-based club said Sosa has agreed to a $400,000 contract, along with a $200,000 signing bonus. The hard-throwing Sosa went 10-2 with a 4.61 ERA for another Seoul club, the Nexen Heroes. Sosa joined the Heroes in May after pitching the two previous seasons with his first KBO team, the Kia Tigers. The Heroes defeated the Twins in the second round of the playoffs in October. Sosa was the winning pitcher in the decisive fourth game of the best-of-five set. The Heroes at first sought to retain Sosa for another season. But he reportedly demanded more money than the $800,000 that the Heroes paid their No. 1 starter, Andy Van Hekken. The NC Dinos announced they’ve re-signed right-hander Eric Hacker, a move that fills their foreign player quota for 2015. The club will pay the 31-year-old $500,000 next season, up from $300,000 he made in 2014.